I hope you have all had a lovely day for Mother’s Day, doing whatever is special to you 🙂 My mother-in-law and brother-in-law came around for breakfast this morning and the men cooked up a wonderful brunch, all the better because I was not in the kitchen! I’m really excited to start reading my present too … Twilight!! There’s been so much interest in this book and the movie was spellbinding, I’m really curious to see the writing that has inspired so many … and as a closet fantasy writer, I’m sure to learn a lot! Anyway, back to card making!! This is the card I made for my mother-in-law, using the stamp sets A Rose is a Rose, Friends 24-7 and Wonderful Favourites. I really love the way A Rose is a Rose and Friends 24-7 goes together in this card. They could be from the same stamp set!! The roses are two-step stamped in Real Red and Bravo Burgundy and the petals are in Old Olive and Always Artichoke. I wanted a really soft effect for my Damask image from the Friends 24-7 stamp set, so it has been stamped off in Old Olive. The papers I’ve used are Bravo Burgundy, Old Olive, Whisper White and Whisper White textured (for the large background). The ribbon across the middle of the card is Bravo Burgundy wide grosgrain and I’ve used the Eyelet border punch for the detail along the bottom of the card. There are three of the big white half pearls from the Pretties Kit in the top right hand corner. 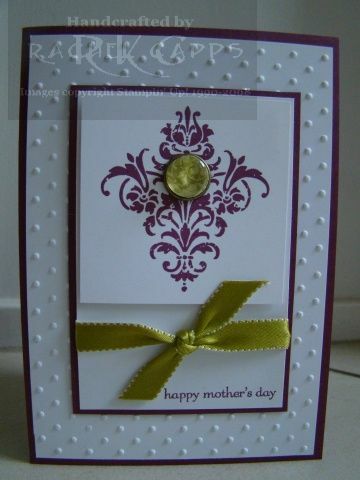 The sentiment ‘Wonderful Mother’ has been stamped in Bravo Burgundy using the stamp set Wonderful Favourites – what a great set this is, so versatile! And most exciting of all to me … like a card maker’s mother’s day present … was the chance to use the Build-a-Brad on this card, for the first time!! I’ve punched out a rose bud from the Bella Rose DSP (part of the scrapbooker’s special this month!!) and the adhered it to the brad, stuck on the so-cool acrylic bubble and then attached it to the centre of the Damask image. And a card wouldn’t be a card without Dazzling Diamonds, would it?! I’ve added DD using Crystal Effects on the roses. 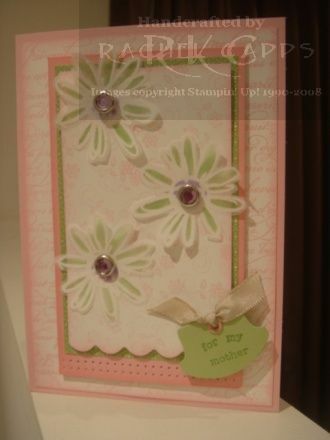 Well, this Sunday is Mother’s Day, as you all know 🙂 And this is one of the best reasons why I love to make cards, because I can give my mum a handmade Mother’s Day card this weekend (well, post it to her as she lives a long way away!). Aren’t all mums obliged to love the handmade creations of their children?? I’m sure that obligation is meant to never stop!! LOL!! 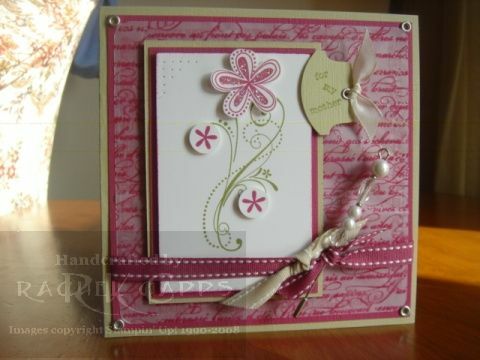 I’ve used the gorgeous stamp set, A Rose is a Rose, and I’ve made another shaker card. Too much fun!! 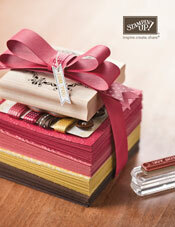 The cardstock colours I’ve used are Riding Hood Red and Kiwi Kiss textured with the usual Whisper White. The new Kiwi Kiss ribbon is sooo soft! beautiful! The stamped flowers that frame the shaker square are stamped in Riding Hood Red, Pink Pirouette, Kiwi Kiss and Old Olive. The rose in the centre is stamped in Barely Banana and So Saffron. And I’ve filled the shaker square with Chunky Sprinkles – gotta have some bling! The sentiment comes from the fantastically priced Wonderful Favourites. How would you like to learn a new technique? Well, come along to my mother’s day technique class on Monday night at 7.30pm. I’ll be showing everyone who comes how to use a heat tool and embossing powder … we’ll love watching the WOW magic of turning powder to shine! We will make one mother’s day card, or you will be able to alter the card to someone else very special, whatever suits you. 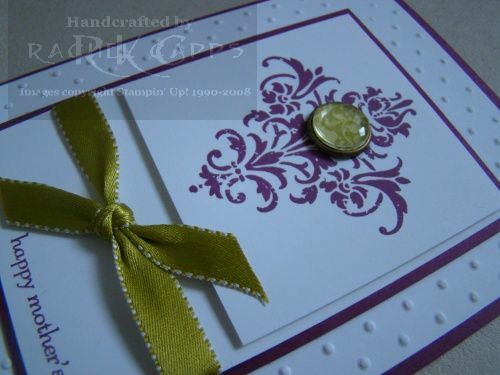 The cost is only $10 with all materials included as well as the envelope that you can stamp to match your card. 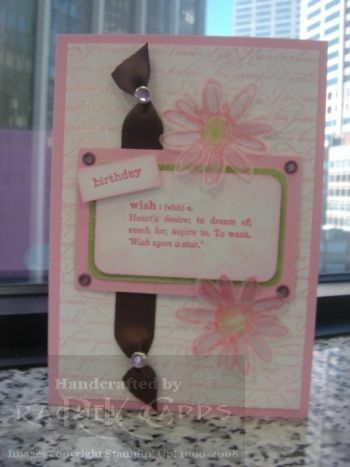 This card is an example of the type of card we will be making (my apologies for the poor lighting in the photo). I made this card using the En Francais background, Boho Backgrounds and Petal Prints. The Petal Prints flowers are embossed with white embossing powder on vellum cardstock. It is really easy to cut out flowers on vellum paper! I also used my new crop-a-dile to set the pretty in pink eyelet on the round tab punch ‘for my mother’, the words were stamped using Everyday Flexible Phrases. I think everyone who comes to my class on Monday night will also get to play with my crop-a-dile. It is sooo easy to use!! Bookings are essential, so email me today.